Dragon Age: Inquisition will utilize the Dragon Age Keep, which will allow players to customize a "historical world state" based on choices from the first two games. As much as the Dragon Age series is a franchise about commanding a team of fantasy warriors in battles against monsters, horrors and whiny, whiny mages, it's also a game about choice. Throughout both Dragon Age: Origins and Dragon Age 2, players are confronted with decisions that can affect the course of the story across games. Fans of the series, in turn, have understandability been wondering as to how Bioware plans to bring their past actions to the series' next iteration, Dragon Age: Inquisition. Those players can stop wondering because Bioware has unveiled the Dragon Age Keep. Whereas Dragon Age 2 allowed players to import their save files from the first game to influence elements of the sequel, the Keep will give them the freedom "to customize a Dragon Age historical world state to your exact specifications." According to a blog post by Mark Darrah, executive producer for Dragon Age, "you'll be able to customize as much or as little about the world of Thedas as you wish." This will allow players to not only recreate the world the way they left it in past games, but also to tweak any elements or events they might have wanted to go differently. While the studio is "continuing to investigate ways in which save files from previous games could be used," it devised the Dragon Age Keep as its primary solution to several problems. Darrah admits, for instance, that "some current save imports are buggy." The data files created by the Keep will presumably be more stable. Likewise, the Keep provides a way for player's choices to bridge the gap between the next-gen consoles and their predecessors. "It was a priority that our fans be able to have their decisions carry forward, regardless of their past or future platform," explained Darrah. All of these good and logical explanations aside, as someone who invested quite a bit of time in Origins and Dragon Age 2, I think it will still feels disappointing to not be bringing my actual save file to Inquisition. Importing your is, in some ways, like an acknowledgment of the work you put into the game and the experience you had. Even if you can create something identical with the Keep, to me it's just not the same. 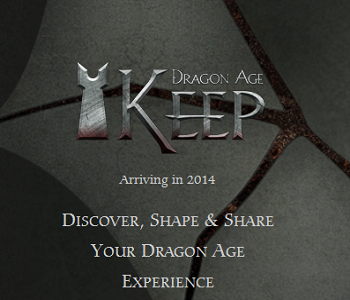 That said, I'm curious to see what other's think of the Dragon Age Keep. Are you for it, or are you a sentimentalist like myself who's going to complain about an arguably ideal solution to a genuine problem? Either way, if you're interested in being a part of the Keep's beta, you can sign up now.